Whether by road, train or plane and with options to suit your group’s budget and requirements, the magic of Disneyland® Paris is closer than you think! If you are not arranging your own transport, we would be able to arrange this for you. 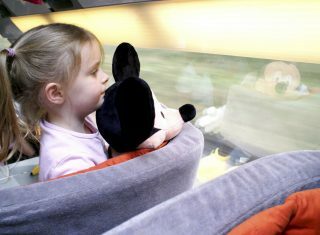 Sit back, relax and head straight to the doorstep of the Disney® Parks in under 3hrs from central London with Eurostar’s dedicated service direct to Disneyland® Paris. Departing London St Pancras mid-morning, calling at Ebbsfleet and Ashford International, you’ll arrive early afternoon at Disneyland® Paris. Return services depart for London early evening, allowing you to make the most of your arrival and departure days in the Disney® Parks. Direct Eurostar trains operate four days a week and run seven days a week during school holidays. Alternative services are available travelling via Lille or heading to Paris Gare du Nord. What’s more, with Disney Express Luggage Service you can head straight into the Disney® Parks while your luggage is transferred to your hotel! You can reserve your seat with just a low deferred deposit, with balances due closer to travel. So grab your passport, you’ll be in Disneyland® Paris quicker than you think. We can arrange executive coach hire from your local area to take your group to Disneyland® Paris. From pick-up times, Channel crossings by ferry or Euro tunnel and maybe even a visit to Paris or Cite Europe, your itinerary will be tailored to your group’s requirements. Flying from across the UK to Paris Charles de Gaulle, Orly or Beauvais Airports, it’s never been easier to jet to Disneyland® Paris! With a choice of airlines and flight times to suit, we can also arrange private transfers to meet you on arrival and take you direct to your hotel. Don’t hesitate – pack your cases today! Thinking of taking the car? Then we can help you make your way over the Channel! We get fantastic rates with P&O Ferries, Eurotunnel, Brittany Ferries and DFDS Seaways for the various routes from the UK to the continent. You’ll even be able to park for free at your Disney® Hotel. Please call to discuss the best option for your group.